As I wrote previously, prescription drug abuse is increasingly making up a larger share of America's drug abuse problem. Even high profile news outlets like CNN have begun to pay attention to the phenomenon. The upside is that all this attention will lead to people learning more about the harmful effects of prescription drug abuse and the routes to recovery, such as a Xanax Drug Test aka a Valium Drug Test. A sad string of celebrity deaths has brought a lot of attention to this subject recently. DJ AM, for example, overdosed on OxyContin (also known as oxycodone - you can buy an oxycodone drug test here) while Michael Jackson died from overdosing on a very dangerous prescription drug. The point of Jane Velez-Mitchell's CNN article though is, in her own words, "[that] it's also happening right now, as we speak, to average Joes and Janes in homes all across America." Velez-Mitchell points out that prescription drugs are now the leading cause of drug overdoses in the United States. Prescription drugs are not a safer way to get high - they can lead to dangerous dependencies and are highly addictive. They can be particularly destructive when paired with alcohol. One of many ways to deter the use of prescription drugs is to use a Xanax Drug Test, aka a Valium Drug Test, to determine if a prescription drug of the benzodiazepine family has been used within the past 3, sometimes up to the past 7, days. Benzodiazepines are a class of prescription drugs that include Xanax, Valium, and Klonopin. Benzodiazepines are psychoactive drugs that all look the same - their core chemical structure is the fusion of a benzene ring and a diazepine ring. 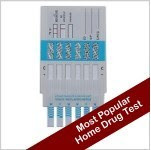 So the purchase of a Xanax Drug Test means that you can detect any of the other dangerous prescription drugs in that family as well, with 96% accuracy. If you believe that a benzodiazepines drug test is a tool you need to combat prescription drug abuse or addiction, you can visit Home Health Testing to buy a Xanax Drug Test or learn more information.